All 2008-W American Buffalo Gold Uncirculated coins for collectors have sold out, according to the United States Mint online store. The one-ounce and one half-ounce gold coins joined the ranks of other fractional sizes, moving to the “product is not available” category over the weekend. Their sales had increased over the previous week by 8.7 percent and 6.6 percent, respectively. The Mint’s gold and platinum coin series has been ablaze in sellouts of late. The American Buffalo gold uncirculated 4-coin set sold out last Monday while the proof quarter-ounce version and the final platinum Eagle uncirculated coins went Wednesday. Collectors have watched the series closely since the Mint reduced its coin prices on November 13 and also announced the elimination of several hundred coins from its 2009 numismatic portfolio, including all options of the American Buffalo Uncirculated Gold Coins. The 2008 Buffalo one-half ounce proof version is still up for sale, but perhaps not for long. It has a delayed shipping notice that could imply its inventory is near zero. The other proof sizes have already disappeared. The CoinNews collector tool U.S. Mint Collector Bullion Coin Prices, Premiums and Sales Figures has been updated. The page can help locate the better priced and more scarce coins, as well as help identify collector bullion coins still available. 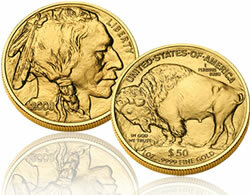 Wait until 2009 Gold Buffalo Uncirculated Coins and Proof Coin to be released by U.S. Mint. If you own 2008 Gold Buffalo, you will profit from the value of coins. Every year the price of coins has be rising faster than inflation rate! To protect your wealth, Please buy Gold and Silver Bullion Coins as well as Commemorative Coins. Also you can buy Platinum Eagle Coins too!